More than 4,000 navy soldiers now sail south along coast of Norway in a maneuver not seen since the Cold War. The huge flotilla from Russia’s Northern fleet are sailing for war. For most of the crew members, the mission outside the coast of Syria will be first time real-war combat-mission. 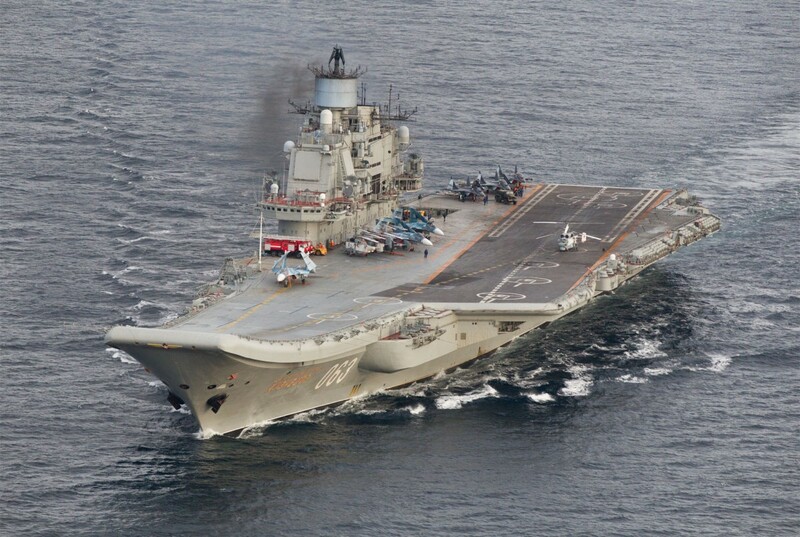 It is also the first time Russia’s two largest naval vessels, the nuclear powered battle cruiser «Pyotr Veliky» and the aircraft-carrier «Admiral Kuznetsov» are on duty for war. It is expected that fighter jets from the aircraft carrier will participate in Russia’s bombing of Aleppo. Cruise-missiles are expected to be launched from the battle cruiser when the vessel is in the eastern Meditteranean. Kremlin’s war against Islamic State in Syria will with the arrival of the heavy naval vessels be strengthen. In addition to the battle cruiser and aircraft-carrier, the group of Russian naval vessels consists of the anti-submarine destroyer «Severomorsk», the destroyer «Vice-Admiral Kulakov», a tug, a surveillance vessel and a tanker. It is also likely that at least one of the Northern fleet’s attack-submarines are sailing together in submerged position. Never before in post Cold War times have so many navy soldiers from the Northern fleet been on mission in one group of naval vessels. The «Admiral Kuznetsov» is crewed by 1,960 servicemen. «Pyotr Veliky» has a crew of 727 persons, «Severomorsk» and «Vice-Admiral Kulakov» are both crewed with 300 navy soldiers. In addition are several hundred servicemen onboard the four other support vessels. A typical Alula-class submarine has a crew of 70 persons. In total, more than 4,000 navy soldiers and crew members are right now sailing south. The vessel-group is Wednesday morning at 08.30 off the coast of Norway outside Rørvik, south of the Arctic Circle a spokesperson with the Norwegian Joint Headquarters says to the Barents Observer. The naval group is now heading towards the North Sea and is later this week expected to sail into the English channel. Norway has a frigate, Coast Guard vessels and Orion surveillance aircrafts that have all followed the Russian navy group since it sailed out from the Kola Peninsula into the Barents Sea on Saturday. Other NATO countries are also keeping a close eye on the Russian naval movements. On Saturday, an American nuclear powered attack submarine surfaced outside Tromsø, the local newspaper Nordlys reports. British media says their navy will meet the naval group as soon as it nears British waters in the North Sea. While the largest naval vessels of the Northern fleet steams towards the Meditteranean, other vessels continue with shootings and exercises in the Barents Sea. 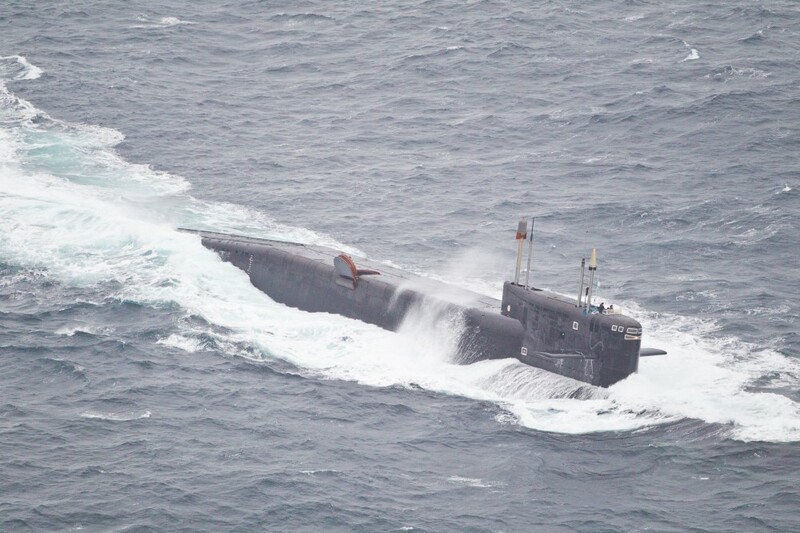 On Saturday, the Oscar-II class nuclear powered submarine “Smolensk” launched a cruise-missile from the Barents Sea that hit a target close to the coast of Novaya Zemlya. Last Wednesday, the Delta-IV class strategic submarine “Novomoskovsk” launched an ballistic missile from submerged position in the Barents Sea. The missile hit its target on the Kura shooting range on Kamchatka Peninsula a few minutes later. It has been a busy autumn for the fleet sailing Arctic waters. In September, a group of Northern fleet surface vessels sailed along the Northern Sea Route to the islands of Kotelny in the Arctic. Larger areas in both the Barents Sea and White Sea have been closed for civilian shipping as shootings with missiles and artillery takes place. Comprehensive Russian naval activity is expected to continue in the Barents Sea until November. Update, Tuesday 18:40: The naval group has informed Norwegian Aviation Authorites it will slow down and launch flying drills off the west coast of Norway in the North Sea from Wednesday to Friday, VG reports. Fighter jets from the aircraft-carrier with take-offs and landings will likely not interfere with Norwegian helicopter traffic to and from oil-installations in the North Sea, nor international air traffic crossing the North-Atlantic that flies much higher in the air.